"My son can now lay to rest," says Tayshea Aiwohi's husband, Kimo. The state Supreme Court rules an unborn child is not a "person"
THE Hawaii Supreme Court has overturned the manslaughter conviction of an ice-addicted mother for causing the death of her newborn son by smoking crystal methamphetamine in the days leading to his birth. In an unusually quick turnover, the justices issued a majority decision yesterday agreeing with mother Tayshea Aiwohi that her unborn child was not a "person" as defined under state law, and that her conduct did not meet the requisite elements of manslaughter. The decision means that in Hawaii, pregnant mothers cannot be prosecuted for harmful prenatal conduct -- whether it be failure to seek prenatal care, or abuse of alcohol or drugs -- when a child is born alive but later dies, said Deputy Prosecutor Glenn Kim. The decision came just 41 days after the high court heard oral arguments, a turnaround that Aiwohi's attorney Todd Eddins called "unprecedented." The high court essentially ruled that "conduct can't be perpetuated on a fetus to justify a criminal prosecution," Eddins said. "Conduct must be perpetuated on a live human being." He said the decision vindicated their argument that punishing women for the adverse outcomes of their pregnancies was counterproductive and against established legal principles. Prosecutors say that although they respect the ruling, they disagree with it and believe they made the right decision to prosecute Aiwohi for the death of her son. "The main reason is because we believe babies such as Treyson Aiwohi deserve the protection of the law and that people like Tayshea Aiwohi -- doing what she did to her baby -- continue to deserve to suffer the consequences of the law for those actions," Kim said. But he acknowledged that the ruling is "the law of the land here now and of course, we will abide by that decision." At her attorney's office yesterday, a tearful Aiwohi, 32, flanked by husband, Kimo, also 32, said she was extremely happy and grateful for the court's decision. "My son can now lay to rest," said Kimo Aiwohi. Aiwohi, who had a long-standing history of substance abuse, was indicted Oct. 9, 2003, for recklessly causing the death of Treyson, who died two days after he was born on July 15, 2001. The Medical Examiner's Office determined the newborn died of methamphetamine poisoning. Aiwohi had argued that her prosecution for manslaughter -- recklessly causing the death of another person -- goes against the plain meaning of the statute because her unborn child was not a "person" who can be a victim of a crime. The statute defines a person as "a human being who has been born and is alive." Prosecutors maintained that although Aiwohi binged on "ice" while Treyson was still in her womb -- three days prior to giving birth and taking a "hit" on the day she delivered -- Treyson was born alive and a "person" when he died. "The proscribed conduct must have been committed at a time when Treyson 'qualified' as a 'person,' defined by the Hawaii Penal Code as 'a human being who has been born and is alive,'" the justices wrote. While the justices recognize that in the prosecution of third parties most jurisdictions do not require that an offense be committed against a person who has been born and alive, these jurisdictions focus on the victim's status at the time of death, not at the time the injury was inflicted. "We are convinced that the jurisdictions requiring that conduct must be committed against a person who has been born and is alive state the more cogent rule," the justices wrote in the majority opinion. Kim said another consequence of the opinion is that prosecutions cannot proceed against third parties who cause injuries to a fetus that is born alive but later dies as a result of those injuries. The state had cited several jurisdictions that have filed charges against third parties stemming from injuries to a fetus that later proved fatal and were successfully prosecuted. The classic case involves a drunk driver who causes an accident that injures a pregnant motorist and her fetus and the fetus is born alive and later dies of injuries stemming from the accident. While prosecutors here can't prosecute the third-party for injury against the fetus, they aren't precluded from prosecuting for injuries against the mother. Aiwohi said she was devastated when the indictment came down two years ago and still feels she is being punished. The charges came at a time when her life was taking a turn for the better. She was in recovery, had returned to college and was working for the state. Although she pleaded no contest to the charge, Eddins said they dispute the allegations that she smoked ice in the days leading up to and on the day she gave birth and that it was exclusively the drug use that killed her son. Aiwohi only relapsed once before giving birth and there were other risk factors that could have contributed to Treyson's death, including being born a month premature and Aiwohi's tobacco use throughout her pregnancy, he said. "Conceivably, if this type of prosecution had withstood appellate rigor, a woman could have been prosecuted for virtually any type of reckless conduct," Eddins said. "To a certain extent, this case had a lot broader appeal than alleged drug use during pregnancy." Aiwohi, who was addicted to "ice" for 18 years, said she intends to continue staying sober. She'll make five years in September, she said. She expects to graduate next year with a master's degree in marriage and family therapy and a second master's in secondary education. The majority opinion was signed by four justices, with a concurring opinion by Justice Steven Levinson and Chief Justice Ronald T.Y. Moon, and a separate concurring opinion by Justice Simeon Acoba that essentially agreed with the results of the majority. 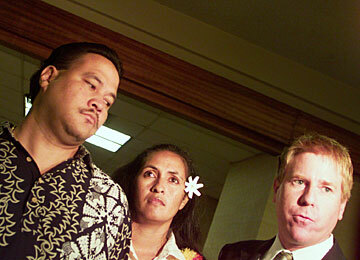 Tayshea Aiwohi is flanked by her attorney, Todd Eddins, right, and husband, Kimo, in court last year after entering a plea of no contest to manslaughter. July 15, 2001: Treyson Aiwohi born to Tayshea Aiwohi at Kaiser Moanalua Medical Center. July 16, 2001: Hospital discharges Aiwohi and son. July 17, 2001: Treyson taken to Castle Hospital via ambulance; pronounced dead at 6:32 a.m.; Medical examiner later find that cause of death was methamphetamine poisoning. Aug. 29, 2001: Aiwohi tells investigator for Medical Examiner that she smoked "ice" on July 12, 13, 14 and one hit on July 15, the day of her baby's delivery. Oct. 9, 2003: Grand jury indicts Tayshea Aiwohi for manslaughter, the first case in Hawaii in which a mother is charged with killing her baby by smoking ice while pregnant. June 3, 2004: Circuit Judge Michael Town denies Aiwohi's motion to dismiss the indictment. June 17, 2004: Aiwohi enters no contest plea to manslaughter under plea agreement that allows her to appeal Town's decision. Aug. 25, 2004: Aiwohi is sentenced to 10 years probation with no jail time. Sept. 23, 2004: Aiwohi files notice of appeal. Oct. 19, 2005: Hawaii Supreme Court hears oral arguments in the case. 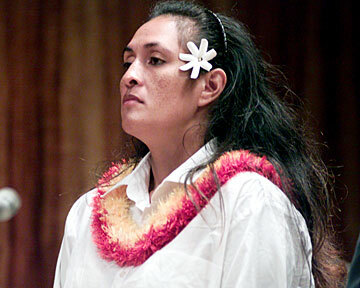 Nov. 29, 2005: State Supreme Court overturns Aiwohi's conviction.